TEMPE, Ariz. — Pete Carroll’s ear-to-ear grin as time ran out pretty much told the story. The life of a pro football coach is 95% pure hell. What 5% remains are usually moments like this, when you can sit back, relish in victory and just plain feel good. In Carroll’s case, this was more than just “feel good”. You could sense that Carroll was trying not to laugh. His team just won a laugher, so you can understand. Carroll watched his squad go to 6-2, and finshed up an October that for a change didn’t turn out to be a disaster. They did it with a ridiculously easy 27-3 win over the Arizona Cardinals. They won this game against a team so inept that they looked like the Cleveland Browns during Week 1. It was hard for Carroll to keep a straight face during Friday’s press conference. He gave Arizona good props with “they’ll be tough and we’ll have to be ready”, all the while keeping a tight grip on his lip muscles. Inside, the coach knew he was really sugar-coating his responses. Actually, his team did take this approach, and the results speak for themselves. They treated today’s “trap game” they way it had to be treated. The blowout win was the result. The Patriots did approach today’s game seriously. No stupid penalties, no poor execution, no turnovers, no brain cramps. Result: a 27-3 win that made the Cardinals look weak, sickly and totally pathetic. The Patriots finally put an inferior opponent away. Well, almost. We could have done nicely without the five sacks of Derw Bledsoe. Three of them came in the third quarter in successive drives. Every one of the five sacks came on third down. The last two came on 3rd-and-3 or less. But elsewhere, this one was a “W” for the good guys right from the git-go. The Cards had eight first-half drives. Six of them went for three-and-out. They collected three first downs on the two that didn’t. The Cards had 77 total yards at the end of the first half. The Patriots had 267. Another early indication of what this affair would turn out to be was a first quarter pass to Terry Allen. Allen lined up as a wideout on the left side. He ran straight down the left side. Drew Bledsoe tossed a perfect lollypop to him, and he caught it in stride. Allen ran 37 yards before someone thought to lay a hand on him, and pushed him out of bounds. What was amazing about that play was that no one saw or touched Allen until he was 37 yards downfield. That doesn’t usually happen when a running back lines up as a wide receiver. When that happens, warning bells usually go off in the defenders’ heads. Not this time. 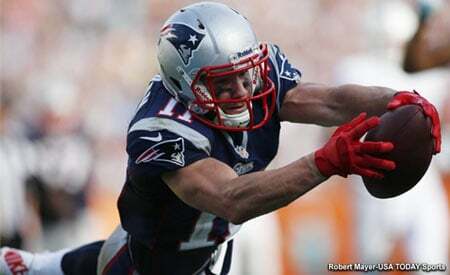 The real Patriot wideouts enjoyed good days at the expense of the poor Cardinal secondary. Shawn Jefferson hauled in two long bombs, and Terry Glenn looked buck naked as he hauled in a 36-yard touchdown pas in the third quarter. Jefferson’s first touchdown catch was a thing of beauty. He slanted over the middle and took in a perfect dart from Bledsoe at the Arizona 40. Tom Knight took himself out of the play as he went for the pick, so all Jefferson had to do was to elude Kwamie Lassiter to take it all the way. Jefferson put a neat juke on Lassiter and it was all over. Glenn’s TD catch was comical. The Cardinals were playing a zone, and strong safety Tommie Bennett let Glenn run right past him. This was predicated upon the idea that someone would be back there to pick him up. Bledsoe’s eyeballs must have fallen out when he saw Glenn out there all by himself. Bledsoe did not overthrow Glenn. Bennett might have been heard saying the word “Oops!” several times over, among other things. This was not the only blown coverage that resulted in a Patriot touchdown. In the first quarter, the Patriots had a 3rd-and-goal at the Cardinal 3. Lamont Warren slipped into the end zone and did a right cross. No linebacker thought to go with him. When Warren caught the scoring strike, the nearest Cardinal defender was in St. Louis. Except for the opening drive of the third quarter, the Cardinals did nothing to generate any semblance of an offense. The three points they did score ruined the chance for the Patriots to hang up a second consecutive shutout on these poor saps. In 1996, the Patriots mauled the Cards 31-0 at Foxborough, and they were able to extend their consecutive scoreless quarter streak against Arizona to six. What few Cardinal fans in attendance today (the box score says 55,830 fans, hard to believe with a near-empty upper deck) spent most of the day booing Brown and his pitiful offense. The Patriots outgained the Cards in total net yards, 386-166. The Patriots doubled the Cardinals in total rushing yards. The Patriots had the ball for 60% of the game. This was a game totally devoid of suspense, intrigue or drama. It was a big win for the Patriots. That’s fine with Patriot Nation. Today’s game wasn’t supposed to be close, interesting or nail-biting. It was supposed to be easy. And it was. The Cardinals should be praised for their playoff win last year at Dallas, their first in 51 years, and coming in a near-impossible venue to win a playoff game at. But injuries, losses to free agency and bad luck have plunged the hapless Cardinals back down into high draft pick territory again, where they usually reside from year to year. The Patriots now have 15 days to prepare for the Jets. The Patriots take next week off, and play Tuna Bowl VI two weeks from tomorrow night. Give Carroll 15 days to prepare for a team, and you can bet…whoops, that line is usually reserved for Carroll’s next coaching opponent. 15 days off, 6-2, easy win today. Life is good for the Patriots. Right now, it should be. And every Patriot fan worldwide ought to go home and ask their Almighty for eight more games that are this easy. And then, three playoff games. This easy. This entry was posted in Uncategorized on October 31, 1999 by Bob George.